as a matter of standard practice we don't weld dissimilar metals, it can be done, but even the best copper/stainless weld has the possibility of failure. so we only connect copper to stainless with a mechanical joint such as a flange, pipe fitting or any other reversible connection. when dealing with alcohol vapor the potential for a crack it the potential for injury or explosion. Interests:Copper Smithing, Anything Motorcycle, Distilling, Music..
Not sure if this is helpful but thought I would throw it out here. This place has 2" & 3" copper tri-clamp flanges available. Might save somebody the need to make a stainless copper connection. I would be hesitant to use them, unless it is a nearly one time seal. Copper is too easily scratch or dinged, or even warped, to be a good seal surface. Fine for a home project maybe, but not for something you are going to sell. If you can't do the copper to stainless joint yourself, at least for fittings, you can purchase fittings with the transitions for Triclamp, windows, etc. Brian is right. Argon with silicon bronze rod. The welding heat will anneal the copper and make it soft You should consider that in your design. Thinner 2 or 3 lb copper will not have much strength unless you do some tricks. I can tig copper and stainless. 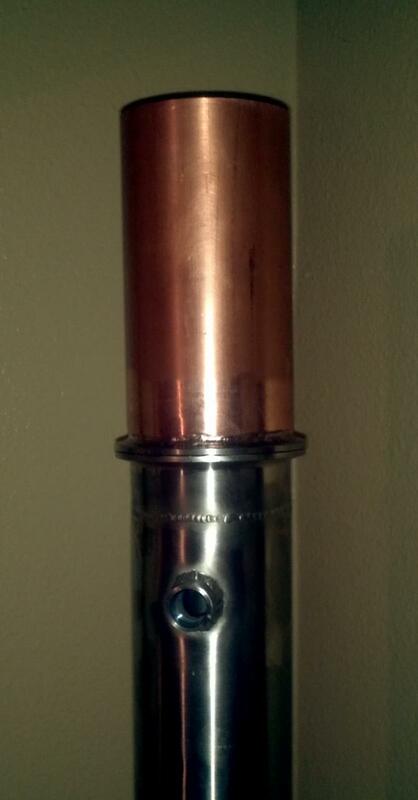 Use deoxigened copper wire, keep the heat on the stainless, and flood the work pieces with argon. Easy...... I have over 20 years of weld under my belt. I will be glad to help anyone. I wonder how well FSW (friction stir welding) would work? Do you guys preheat your pipe at all? I've been having good luck preheating to cherry with my oxyacetyl before going to the TIG. I've been flooding the inside of the pipe with gas as well as the outside, and no filler (autogenous welding). I find that the copper flows over the stainless pretty readily, and my welds are copper colored, but stainless color when I cut it apart. When I took it to the local machine shop for testing, the copper pipe (where we held it in the chuck) failed before the weld. I'm using 1/16" wall pipe. Sounds like your doing ok with what you have. But try to preheat With something else other than the Ox- acetylene torch. The reason is that the acetylene that you're using is a very dirty gas and put high amounts of carbon in the material and when you're using stainless and copper you don't need carbon in your material so if you would go with the cleaner fuel like liquid propane it would probably be a lot better for you. I would suggest just a small little LP torch. Also keep your heat on the stainless just like you're doing.